For nearly a century, it has been a commonplace of Central European history that there were no Jews in medieval Prussia—the result, supposedly, of the ruling Teutonic Order’s attempts to create a purely Christian crusader’s state. In this groundbreaking historical investigation, however, medievalist Cordelia Hess demonstrates the very weak foundations upon which that assumption rests. In exacting detail, she traces this narrative to the work of a single, minor Nazi-era historian, revealing it to be ideologically compromised work that badly mishandles its evidence. 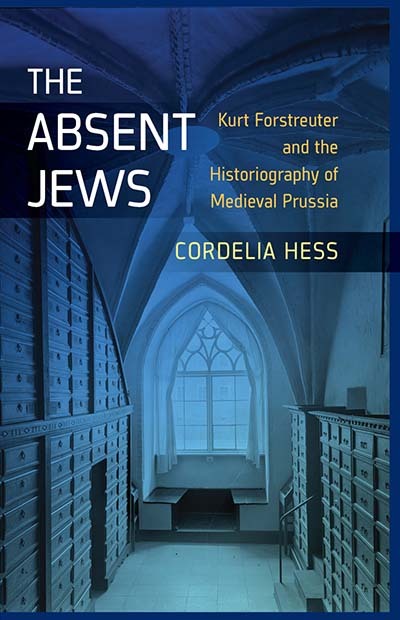 By combining new medieval scholarship with a biographical and historiographical exploration grounded in the 20th century, The Absent Jews spans remote eras while offering a fascinating account of the construction of historical knowledge. Cordelia Hess is a Senior Lecturer at the Department of Historical Studies at the University of Gothenburg and a Research Fellow at the Royal Academy of Literature, History and Antiquities, Stockholm. Her publications include Social Imagery in Middle Low German: Didactical Literature and Metaphorical Representation (2013) and, as co-editor, Fear and Loathing in the North: Jews and Muslims in Medieval Scandinavia and the Baltic Region (2015, with Jonathan Adams). Chapter 4. A Ban on Jewish Settlement?